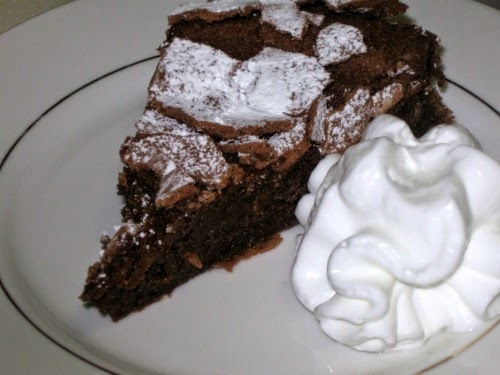 Brian and I have always gone to his family for Passover Seder and have always brought one of the desserts, traditionally the flourless chocolate cake. Manhattan has no shortage of bakeries offering the Passover-friendly treat at this time of year and we've shopped around for ours at quite a few of the more popular venues. We've learned a few things...we need to order early...we need to pay a lot...we need to prepare ourselves for a very thick, dense, fudge-like creation that will sit like lead in our stomachs after the large holiday meal. Yes, some of the specialty gourmet stores offer a lighter "soufflé" version...at an even more outrageous price. Last year I'd finally had enough of this annual annoyance and decided to bake my own. 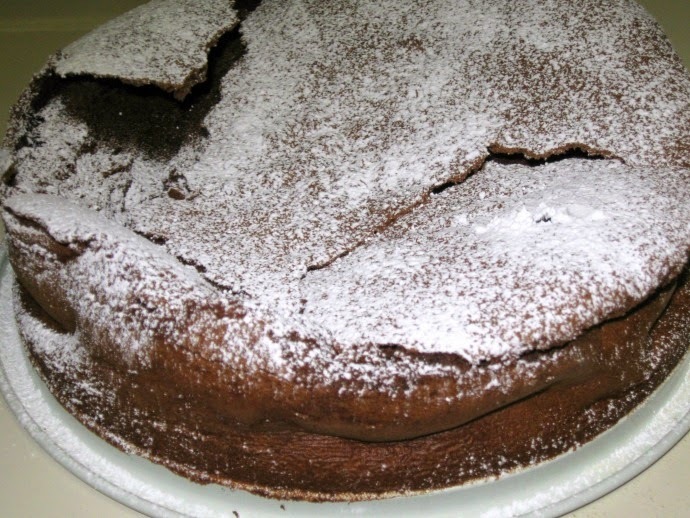 Flourless chocolate cakes (sometimes called "cracked earth" cakes due to their obvious appearance) have become quite fashionable, Passover notwithstanding, and I found lots of different recipes. Almost all are some combination and treatment of chocolate, sugar, butter and eggs. 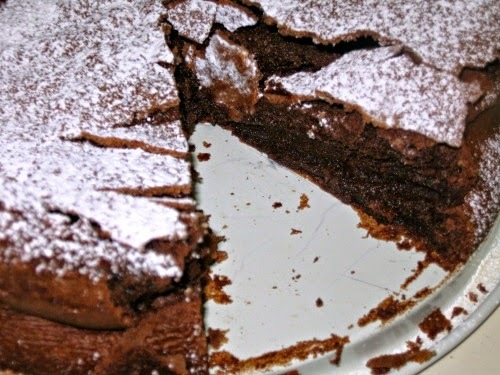 Unseparated eggs will produce the dense fudge-like version but separating them and beating the whites will give the cake some of its missing leavening and produce more of a soufflé appearance and texture. Some flourless recipes do actually include a little flour to help stabilize the batter but even the tiniest bit is forbidden on Passover. I did, however, find some Passover cake meal (a holiday acceptable flour substitute) to do just that and also allow me to butter and "flour" my pan. If you follow this blog you've read that last year's attempt produced a delicious disaster but I've had an entire year to work out the kinks. I bought a new spring-form pan to replace the one that was mysteriously lost and added some basic flavor enhancers like vanilla and salt even though most recipes strangely omit them. The result was perfect! It had a gourmet look, an excellent taste and was surprisingly light. The universal opinion was that this cake would be well received any time of the year and the guests devoured every slice while ignoring the other dessert offerings on the buffet table. I used Ghirardelli chocolate, which Brian loves, but any high quality chocolate will work. 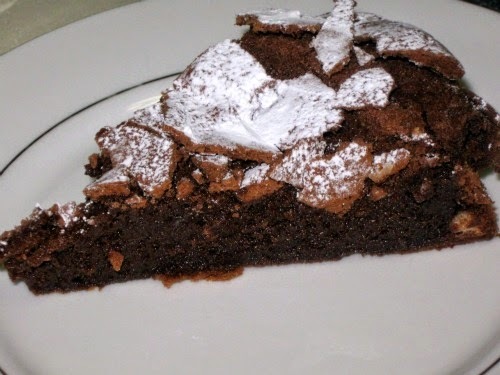 I've made the cake with plain baking chocolate but with so few ingredients and the chocolate playing such a prominent role, the higher quality chocolate made a huge difference. Enjoy! Pre-heat the oven to 350 degrees and butter and flour a 9" spring-form pan. Melt the butter and chocolate in a double boiler or in the microwave and set aside to cool. Separate the eggs and mix the four yolks with the vanilla, salt and half the sugar. Beat until the batter thickens and lightens in color. Beat the egg whites separately until frothy and gradually add in the remaining half of the sugar. Continue beating until stiff peaks form. Add the cooled chocolate and butter mixture to the egg yolk mixture, add the cake meal or flour and mix thoroughly. Gently fold in the beaten egg whites. Bake for 40 minutes and allow to cool thoroughly before removing from the pan. Dust the top of the cake with the confectioner's sugar and serve with berries or whipped cream. Makes 8 servings. Is it possible to divide these into muffin tins in order to make individual servings? Hmm. I've never tried it so I'm not certain. I'm sure the batter would cook properly but the time in the oven might be affected. I would also caution you to use muffin/cupcake liners because I believe that otherwise the muffins will not come out in one piece. It's certainly worth an experiment and, if you try it, I'd love to know the outcome. How many days ahead can this cake be made? Hi Sharon - because of the souffle nature of this cake, I recommend you make it the morning of the day you're serving it. The day before will probably also still work but I wouldn't go any earlier than that or it may get soggy and deflate.